My musical success can be largely attributed to my own teachers. Although I began learning at age six, my lessons, practicing, and as a result my playing all came together when I began lessons with Alex Bohrer at age eleven. Alex' teaching style put music theory to practical use in the music I learned. This knowledge of how music was constructed gave me a deeper understanding of music. Instead of just learning what notes to play, I learned why I was playing those notes. This style of music education is present in the lessons I teach. Instead of learning chords and scales in a cold, academic way, you'll learn how they fit into the songs you're learning. This understanding of a practical application of music theory will not only let you learn new songs faster based on your understanding of underlying patterns, but you'll be able to write your own music and improvise. After leaving Texas for New Jersey to attend College, I began studying saxophone with Vincent Herring and piano with Harold Mabern at William Paterson University. Outside of school, I took private lessons in New York City with Doug Yates on bass clarinet and Mark Shim on saxophone among others. In 2014, I moved from New York City to Baltimore to attend the Peabody Conservatory on a full scholarship in order to study with the legendary saxophone player Gary Thomas. I bring the knowledge of these musicians as well as the many others I've performed with into lessons with more advanced students. At age 19, I began teaching my own students. Six years later, I have the experience of passing on my musical knowledge to students as young as 4 all the way up to adults in individual lessons as well as group settings. I'm currently offering lessons in the Philadelphia area and online through Skype. Contact me through the "Contact" page for rates. Piano: Alex Bohrer, Jeff Hellmer, James Weidman, and Harold Mabern. Saxophone: Paul White, Justin Vasquez, Vincent Herring, Mark Shim, and Gary Thomas. "I took private lessons with Nate during one of the busiest semesters during college....and am so thankful for it. Every time we met, Nate would go at my pace while simultaneously challenging me to push myself musically, showing me by his strong, confident, and knowledgeable example. Excellent teacher." 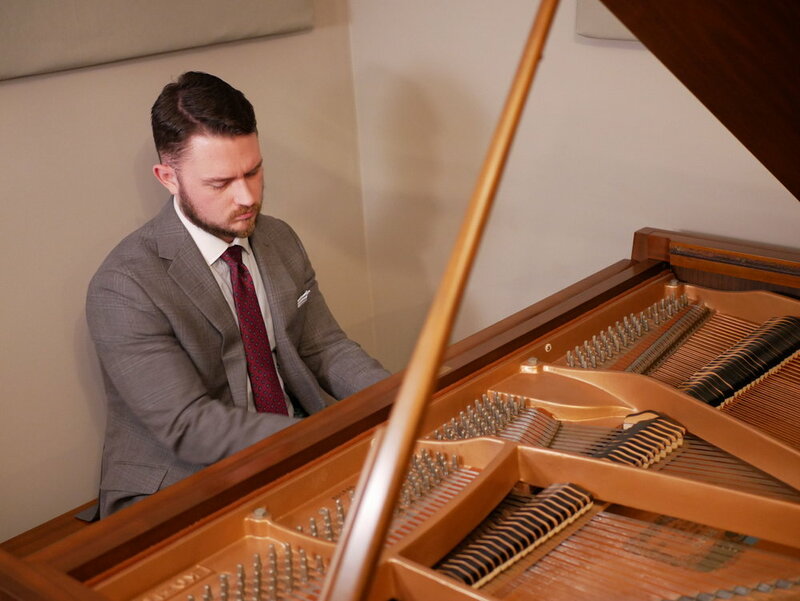 "Nate was a fantastic piano teacher, and fit perfectly with my style of learning. I started out with a very rudimentary understanding of jazz piano, and quite a few misunderstandings. Nate was excellent at guiding me through both the technical and theoretical elements of jazz piano. Some concepts are better demonstrated through showing, others through telling—Nate has a great intuition for tailoring his instruction to the material and the learning style of the student. In addition, Nate clearly has a deep love and appreciation for jazz music, and helped me develop a more mature relationship with the genre. I would highly recommend Nate to any student in the early stages of learning jazz." "The lesson was excellent, he easily designed the the lesson to go over what I was wanting to learn. He is a very talented musician and I'm sure he would be a good teacher of all levels." "So far I am very happy, Nate is a very patient and good teacher for me and I will continue with him, hopefully every week and progress and listen to him as I find his instruction excellent for me to follow." "I have known Nathan for fourteen years. He started with me as a jazz student and from day one consistently excelled light years beyond my other students in performance and composition. He has long since moved on to become one of the most highly regarded and sought after multi instrumentalists, composers and teachers on the East coast. After quickly achieving his Bachelors in Performance he blew through his Masters and is still only warming up. Nathan is the "real deal" as a serious and proficient jazz musician and composer. He is quickly rising to the top in the jazz world and anyone fortunate enough to have the opportunity to study with him would be wise to do so while he is still taking on students. Many teachers teach because they can not DO. Nathan however is a top ranking extremely accomplished performer and composer who is willing to take on students. There is a huge difference. Bottom line is if you want results then Nathan is one of the Only choices to select from as far as finding a future legend to study with. "I once studied under Nathan Hook". Again I am a full time long established jazz piano teacher who takes piano seriously so I would not be putting my name on it if it were not absolutely spot on."